Free shipping to United States when you buy 2 items from LadybugBowtique. See item details below for sale terms. ~made with a variety of glass and metal beads and charms. Welcome to Ladybug Bowtique! I have been in business for over 15 years. 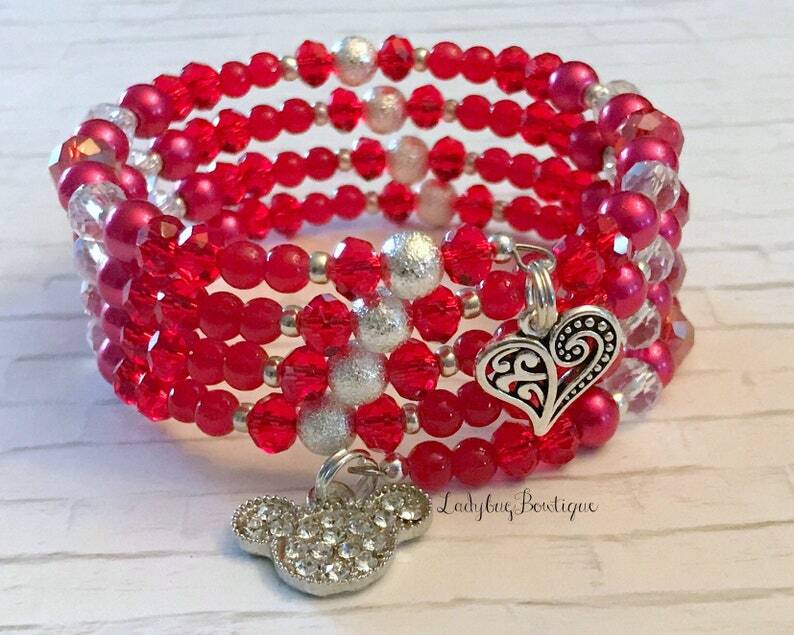 I was the first to create original disney-inspired memory wire bracelets, and continue to offer unique one-of-a-kind bracelets and hair accessories. I have been accessorizing girls and moms for their Disney trips since 2003. ~My bracelets are made with nickel-free quality and strong memory wire. ~I source quality glass and stone beads, with metal accents and charms. I will very rarely use acrylic, rubber or plastic beads, unless they match a design perfectly. You'll see wooden beads in bracelets like Groot, or Moana. Otherwise, you are receiving a bracelet using beautiful, sparkling glass beads. ~To keep your bracelet looking beautiful, wipe it after each wear with a cotton cloth. Store it in a closed velvet/cloth-lined jewelry box. Metal charms and spacers can tarnish over time, but if you keep your bracelet clean and dry it will look pretty for a long time! ~Don't wear your bracelet to swim or shower. Unfortunately we no longer ship outside of the United States. Purchase two or more items and receive free shipping.